Comparing numbers in K/1 using the greater than, less than symbols can be challenging! Young students often confuse the symbols and struggle with the concept. 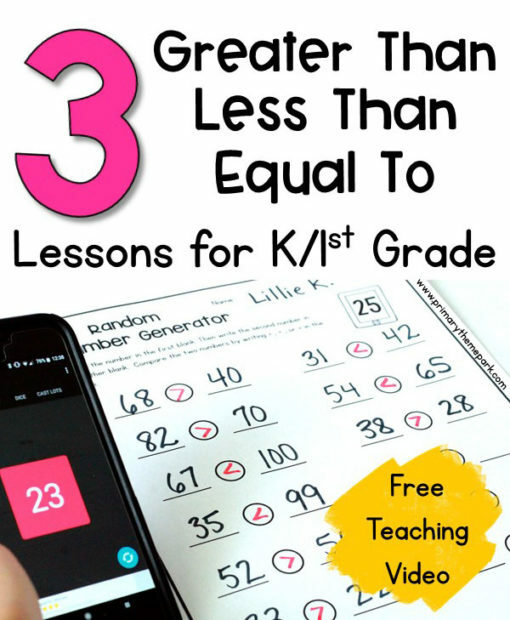 These three Greater Than, Less Than lessons for kindergarten and first grade will help you teach your students how to confidently compare numbers. 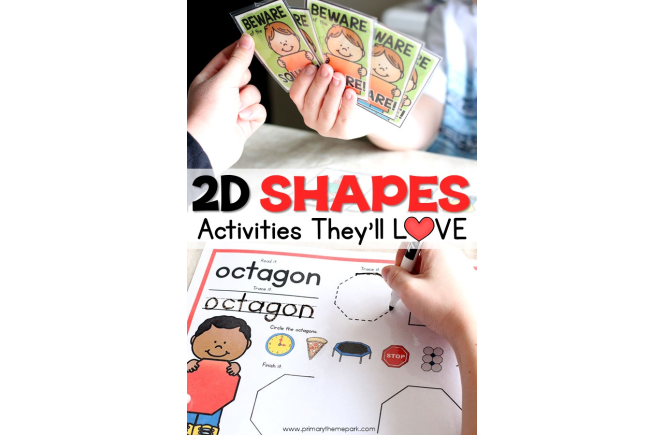 Use these lesson ideas with your whole class, in a guided math group, or for individual students who need extra help with this particular skill. 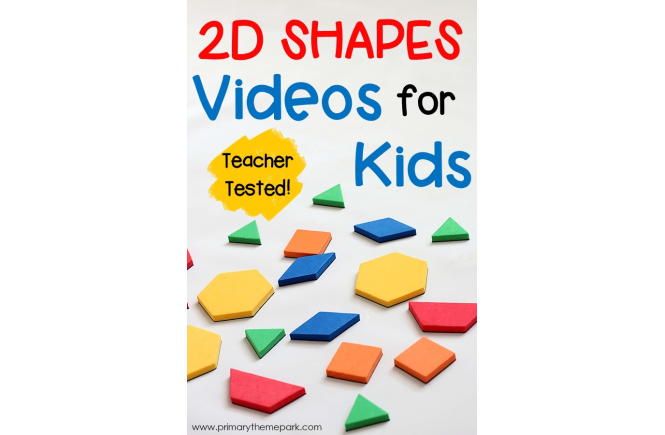 Watch this video to hear me share about each lesson, or read about them below! Begin by showing students two plates of candy. Make the plate on the left obviously have more candy than the one on the right. Ask students if they get to eat the candy from one of the two plates, which one would they choose and why. I’m going to go out on a limb here and say that students are going to choose the plate with the greatest amount of candy. Who doesn’t want the most candy, right?! Point out that they compared the two amounts of candy. 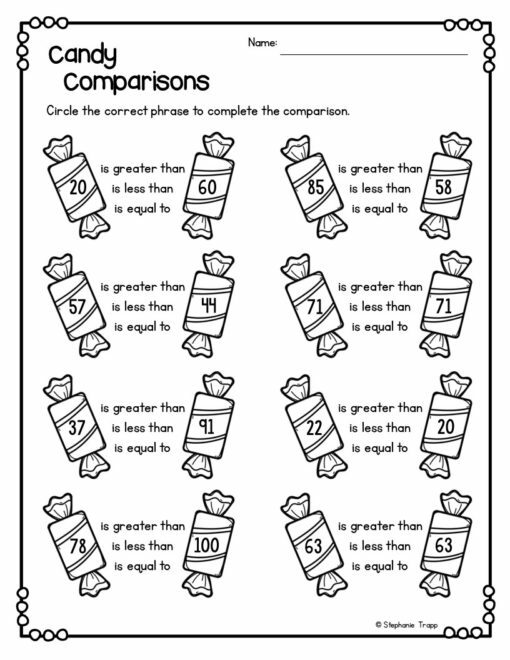 Explain that when we compare numbers or amounts, we decide if one is greater, less than, or equal to the other. 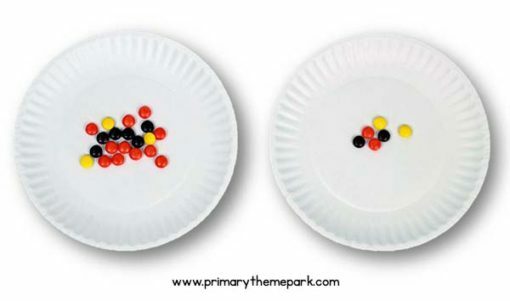 When we look at the plates, we see the amount on the left is greater than the amount on the right. 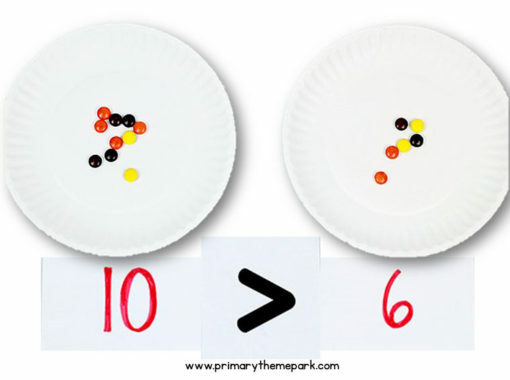 Count the amount of candy on each plate and write it on an index card under the plate. Place a card with the words “is greater than” between the two numbers. Read the comparison using the words and numbers. 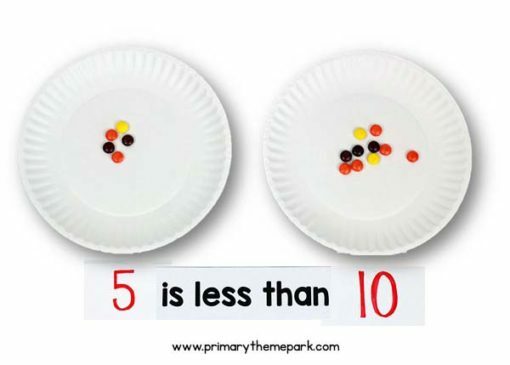 Do more examples like this using different amounts of candy. Count the amount of candy on each plate and write it on an index card underneath. 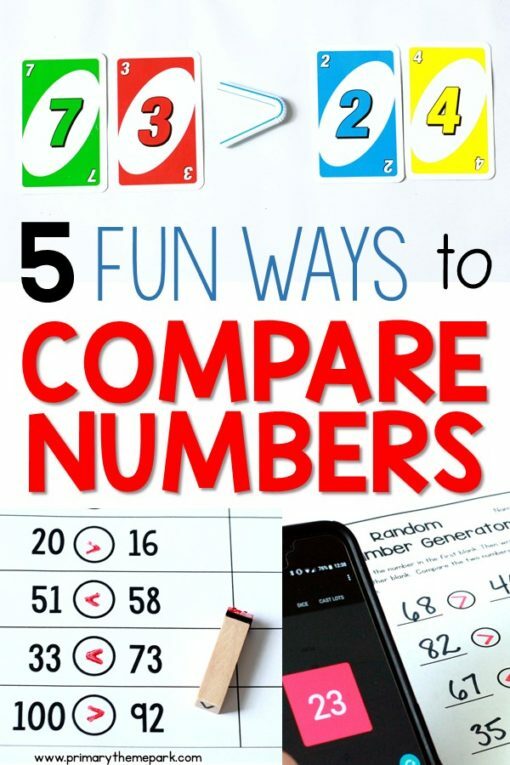 Place the written words between the numbers and read the comparisons. Finally, have students practice comparing numbers using the words “is greater than”, “is less than” and “is equal to”. Using the phrases first helps students when the symbols are introduced later. It also gets them used to reading the comparisons left to right, which is how inequalities are read. On practice problems, use the phrases in the exact same order every time so they know the pattern. 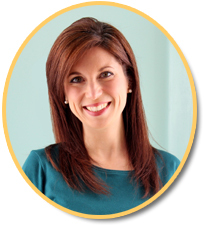 Point out the beginning sounds in the words greater, less and equal to help them figure the words out. 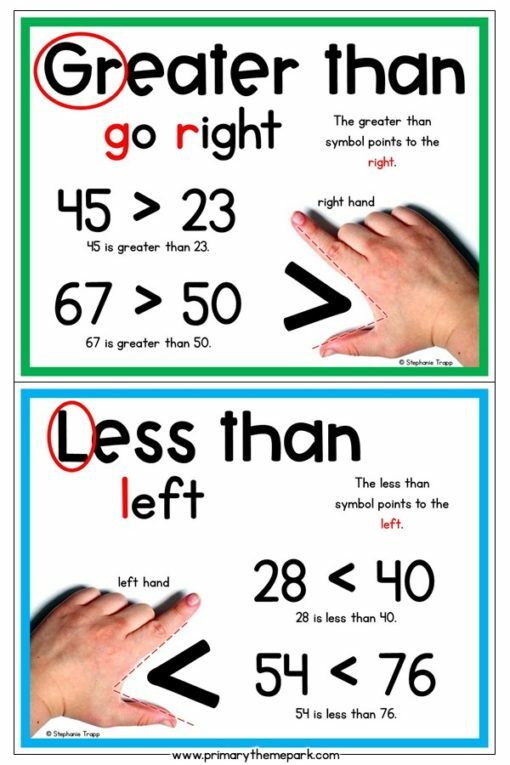 Add the words “greater”, “less” and “equal” to your sight word list for students to learn. Read the phrases aloud to them. Now it’s time to introduce the >, < and = symbols. 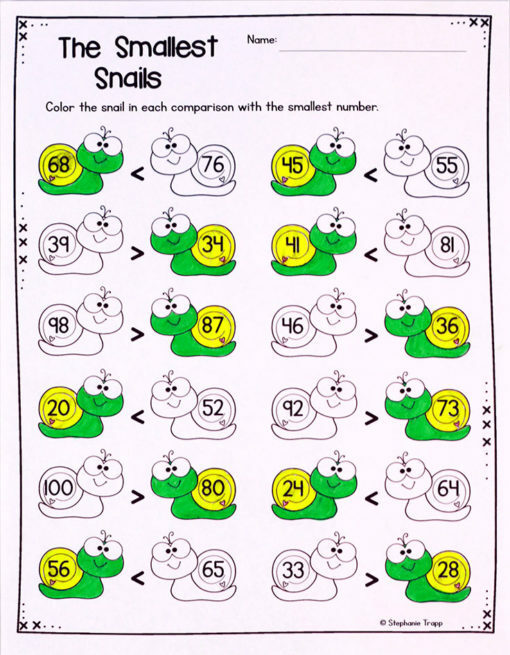 Students are probably familiar with the equal to symbol from addition and subtraction problems. The other two symbols can be a bit tricky! Use the candy and plates from the previous lesson with the word cards in between. Review using the word cards to compare amounts. 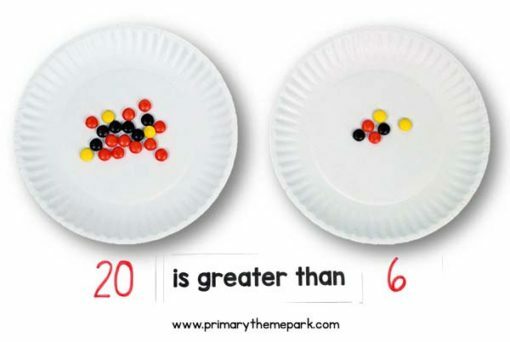 Explain to students that it would take a really long time to compare numbers if we always had to write out the phrases “is greater than”, “is less than” or “is equal to” every time. Thankfully, mathematicians came up with symbols to use instead as a short cut! Many teachers use the “alligator eats the bigger number” method for teaching the > and < symbols. That’s a fun and totally acceptable method. As a matter of fact, that’s how my son remembers which one is which! Unfortunately, I find that trick doesn’t work with all students. It didn’t work at all for my daughter. Even though I knew she got the concept of comparing numbers, she often asked me, “Which way does the greater than symbol go?”. The greater than symbol always points to the right. An easy way to remember this is to say the first two letters in greater, gr, stand for “go right”. 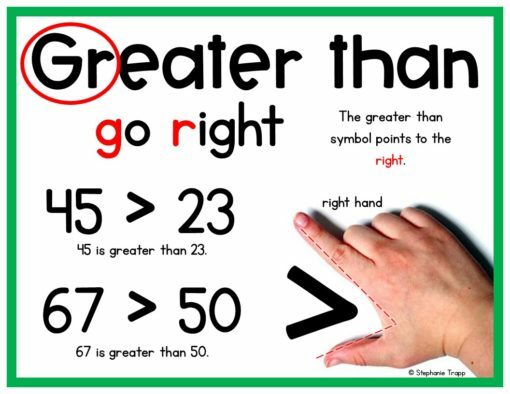 For students who need a visual reminder, the greater than symbol looks like the shape made by the thumb and index finger on their right hand. When students draw the greater than symbol, they “go right” first and then back to the left to make the shape. The less than symbol always points to the left. An easy way to remember this is to say the first letter in less, l, stand for “left”. The less than symbols looks like the shape made by the thumb and index finger on the left hand. 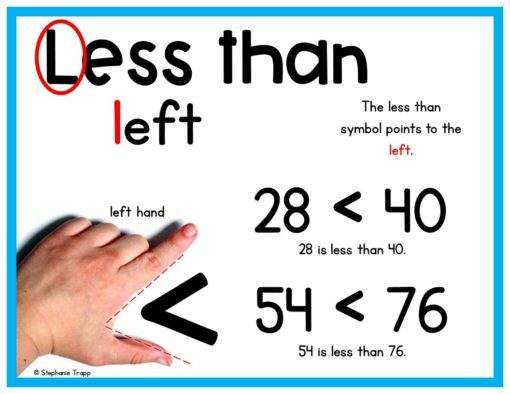 When students draw the less than symbol, they go left first and then back to the right to make the shape. Complete several examples with the candy and paper plates as in the previous lesson, each time replacing the phrases with the symbols. Practice reading inequalities together, pointing out that they’re read left to right just like a sentence. Have students identify the greater or smaller number in the comparison. Review the greater than and less than symbols introduced in the previous lesson. 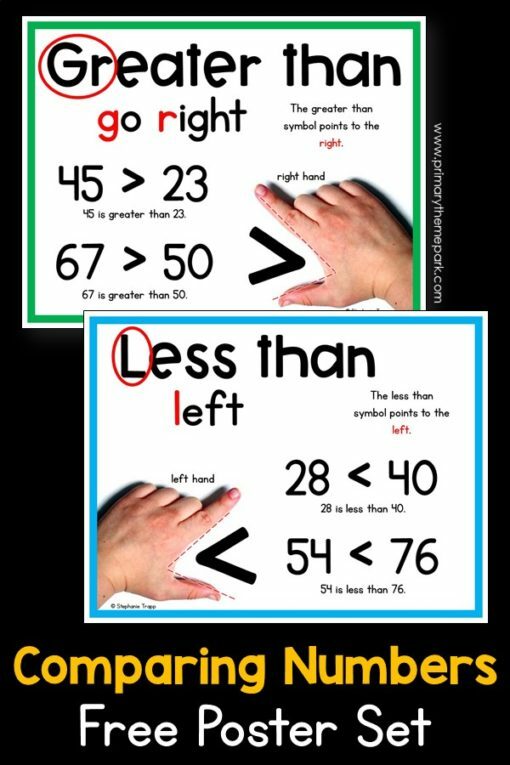 A fun, hands-on way for students to practice comparing numbers is to use a tangible greater than, less than symbol. 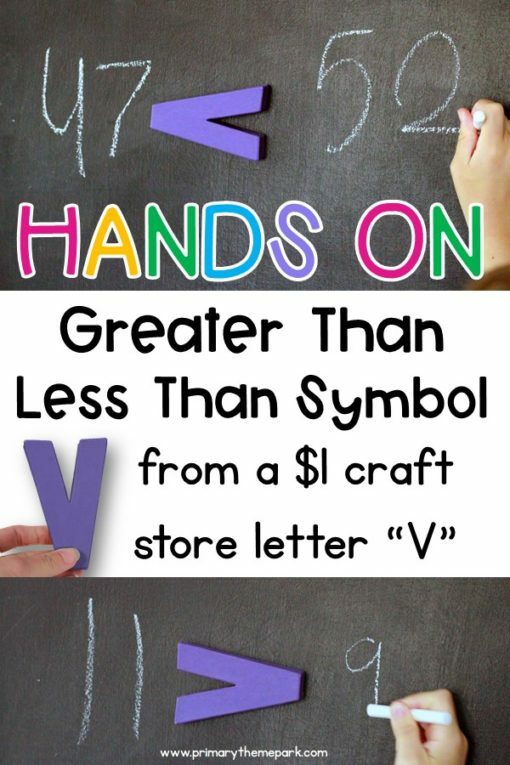 I picked up a small cardboard letter “V” at a craft store for $1. If you turn it to the right or left, it magically becomes a greater or less than symbol! Put magnets on the back, place it on a magnetic board, and allow students to use it to compare numbers. You might have students write two numbers and then place the symbol in between them to make the inequality true. Another idea is give students a number on one side of the inequality and then they write the other number and turn the symbol the correct direction. 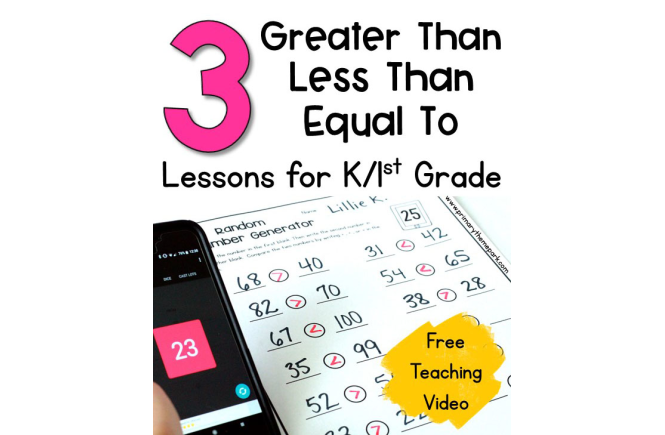 Download the Greater Than, Less Than Posters mentioned above for FREE by clicking HERE! 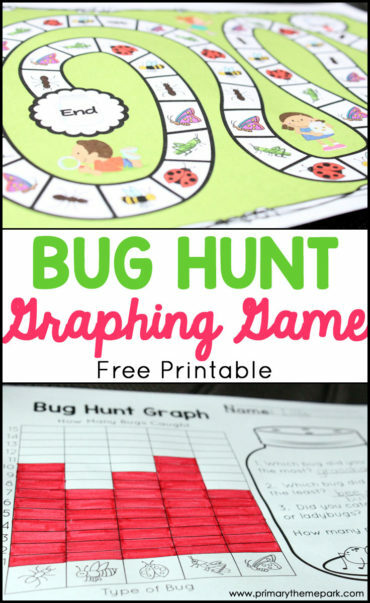 This link takes you to the free comparing numbers video in my TPT store. The posters are available for free with the video. Download the posters by clicking on the “Download” button where it says “Supporting Document Included”. I am looking for resources for my grandson who is in 1st grade. He is now being Home schooled after a year and a half of private school. I teach 4th grade so don’t have enough resources for him yet.